It’s that time of year for a wrap up of our coolest paint jobs, restorations, or jobs from the previous year. We’ve been busy and are fortunate to have a lot to choose from! 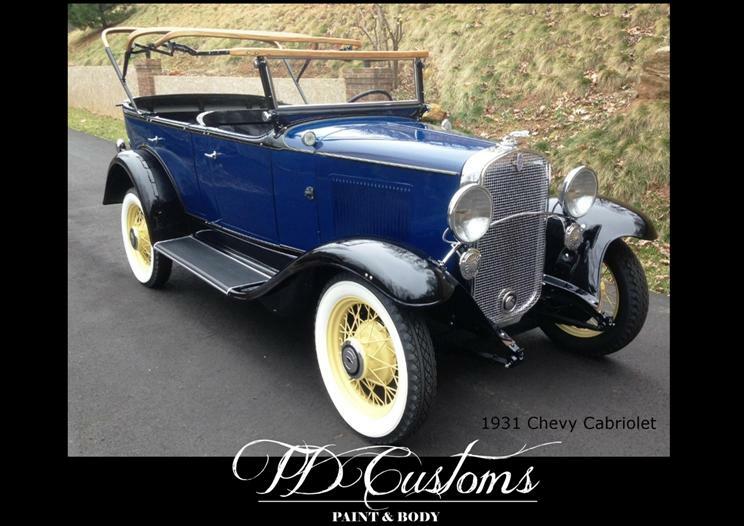 For January we have the 1931 Chevy Cabriolet that we did body work on and painted in parts. When this one left our shop, it was in pieces The owner had done a lot of work on the case, and wanted to assemble it himself. He also added a black vinyl top that compliments it really well. This classic car is a beauty! Read more about the ’31 Chevy Cabriolet. In February, we’re looking at the impressive Polaris Slingshot. The owner of the Slingshot came to us from over 3 hours away! He was looking for a custom shop that could change the front end, and add some flames. Tim painted the flames on the front, and now it’s got a cool, custom touch that not everyone has! 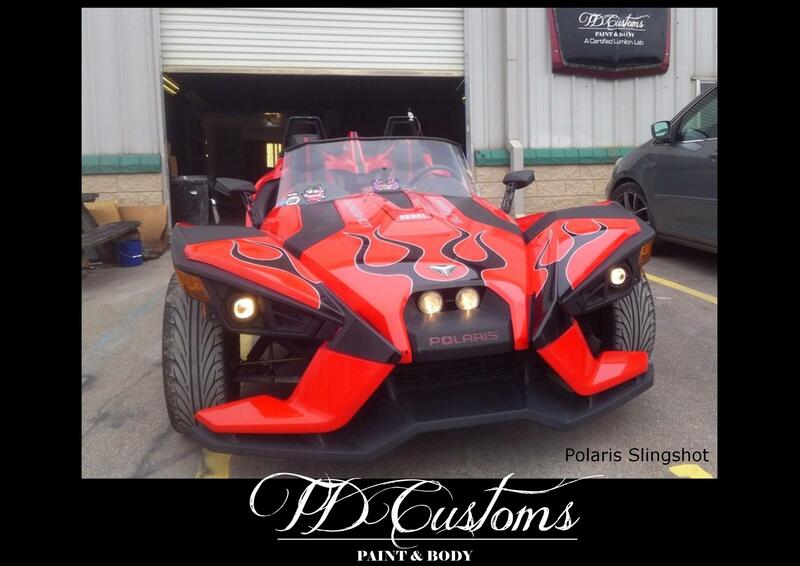 Read more about the Polaris Slingshot Flame Paint Job. In the spirit of custom paint, we’ve got the Envoy (mine!) with the very custom paint job. What started out white, now has a custom look with the blue, seafoam, and silver colors. The possibilities are really endless when it comes to changing the paint on your car. What are you favorite colors, and what design might be right for you? 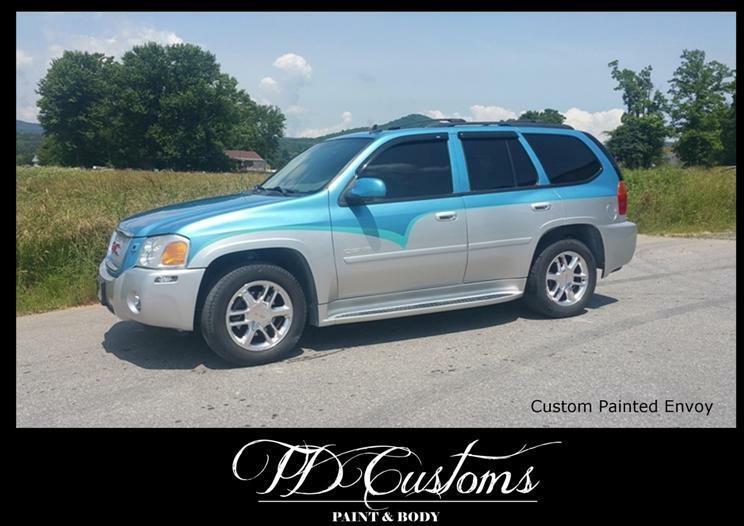 Read more about the Custom Painted Envoy. 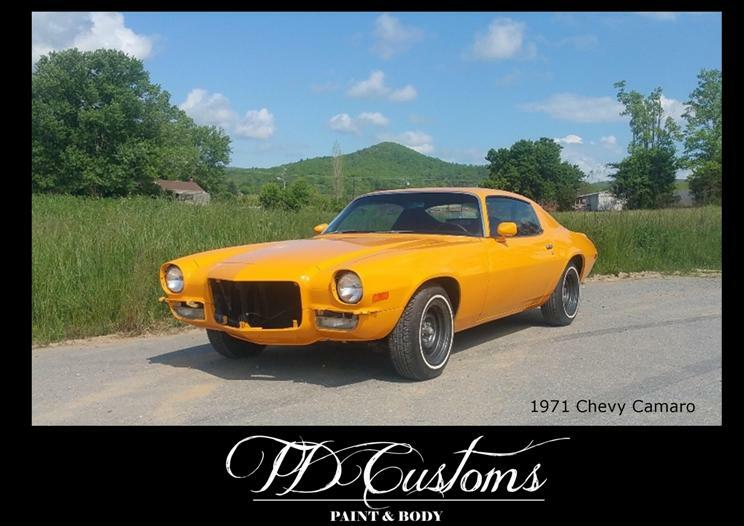 When it’s time to ring in Spring, we’ve got the beautiful 1971 Chevy Camaro. It was painted this striking yellow color that was originally seen on a GTO Judge. The owner is a Hendersonville local, so we’ve already seen the Camaro at a few Main Street car shows. Make sure to look out for it this coming summer! 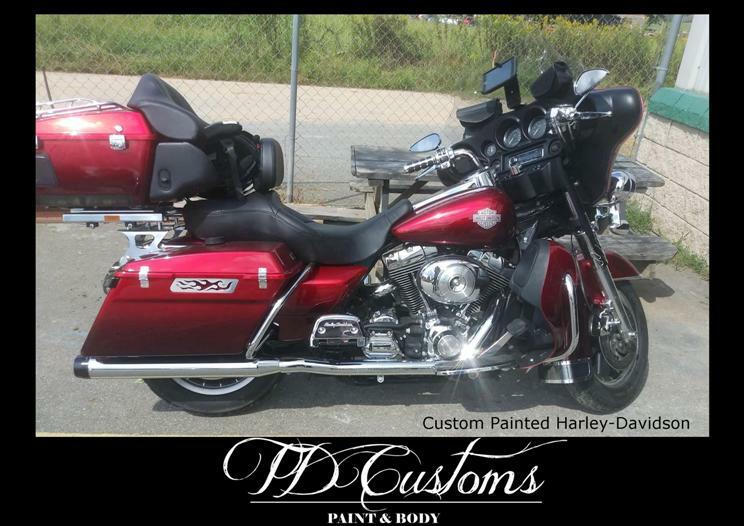 For May, we figured it’s time to bring on the warm motorcycle riding weather, so we’ve got the red fade paint job on the Harley-Davidson. Tim painted the red using two different base coats. You can see the gradient color go from light to dark as you go down the bike. Read more about the Red Fade Paint job. 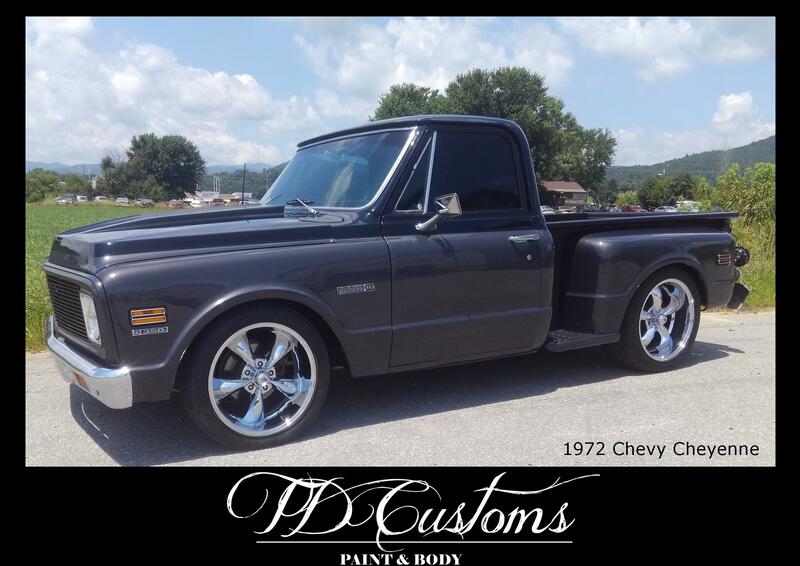 June is Tim’s TD Customs shop truck! This S10 started out a basic factory red and gray from the 90’s. It’s got a custom paint design, with a blue base and black accents. The black also has rainbow metal flake that makes it look a little like a bass boat when the sun hits it. It’ll either look plain black in the shade or flashy sparkles in the light. With a big logo on the tailgate, it’s a good head-turner for the shop! Read more about the TD Customs Shop Truck. 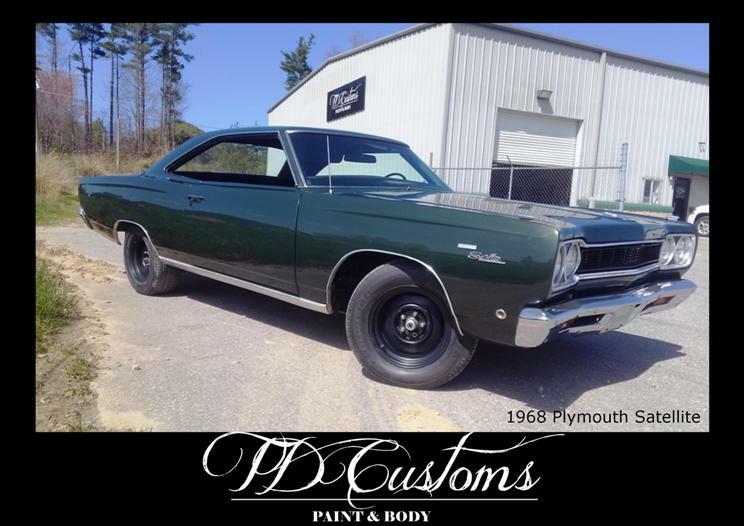 The 1968 Plymouth Satellite full classic restoration is shown in July. This was a big restoration that took a few months this past year. 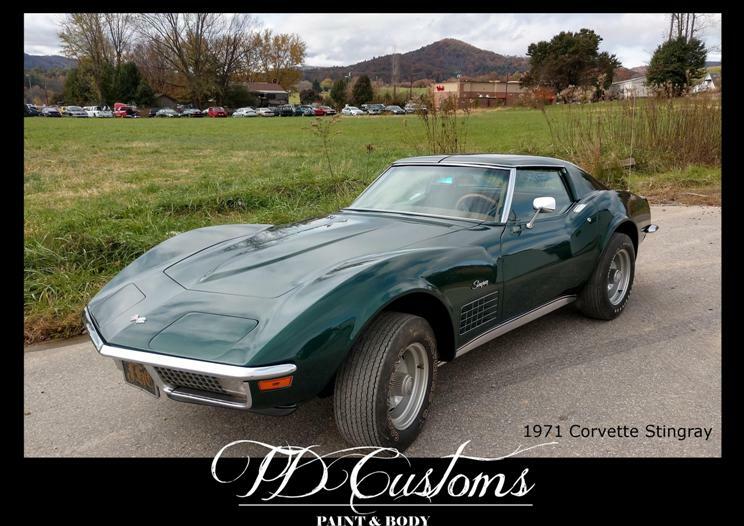 We did extensive body work and rust repair, and painted it a Dark Forest Green Metallic. Read more about the ’68 Plymouth Satellite. 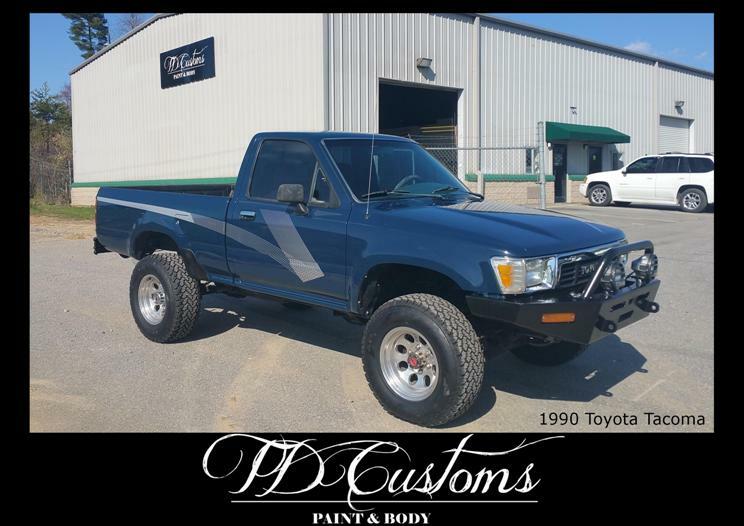 The month of August shows off the ’90 Toyota Tacoma we refinished back to its factory condition. The owner of this truck was serving our country in the military, and his parents helped facilitate the truck getting to and from the shop. The check marks down the sides are factory decals. These complete the look and let you know it’s from 1990. One custom addition to the truck is the front grill, but other than that, it is a beautifully refinished ’90 Tacoma pickup. Read more about the 1990 Toyota Tacoma. 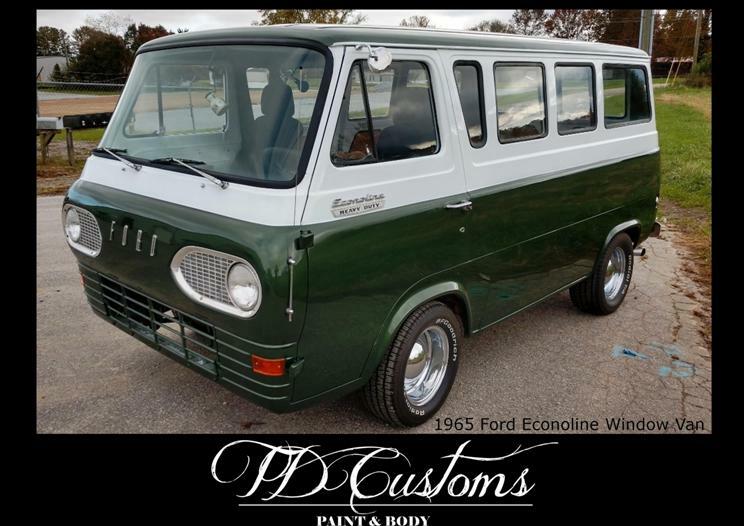 In September, we get to see the custom painted vintage ’65 Ford Econoline window van. This van belongs to the local maple company, Green Mountain Maple. We refinished the body, and painted the van a two-toned green and cream-white. The company added their logo to the side, so maybe you’ll see them driving around town! See the ’65 Ford Econoline after Green Mountain Maple added their Logo. In October, we’re looking at the ’71 Chevy Corvette. Green (and red) seems to be a popular color for Corvettes. This classic was also one that we did a lot of body and metal work on. Corvettes are known for their rounded fenders and curved body lines, so we made sure they were nice and smooth before getting painted. 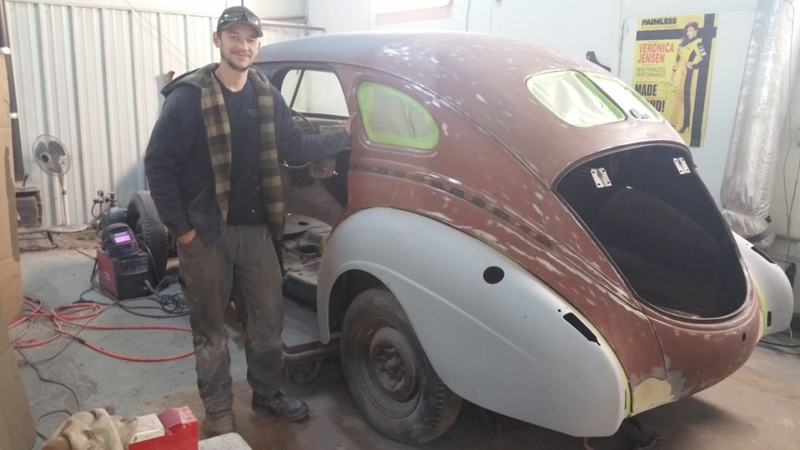 As we’ve done for the last couple of years, November is reserved for the 1939 Chrysler Royal. This specific car has been featured because it is a family car we first got in November of ’16. We’ve slowly worked on it since, with it leaving this year. The classic car, affectionately known as Ruthy, has headed up to NY for its final interior/upholstery work and mechanical work. Catch up on Ruthy here. And finally in December (last, but not least), we showcase the gorgeous 1972 Chevy Cheyenne pickup truck. This classic truck underwent a full restoration. (Anyone remember this one coming in yellow?) We did body work to the exterior, and painted it a subtle two-toned paint job. It is black on the top, dark metal grey on bottom. 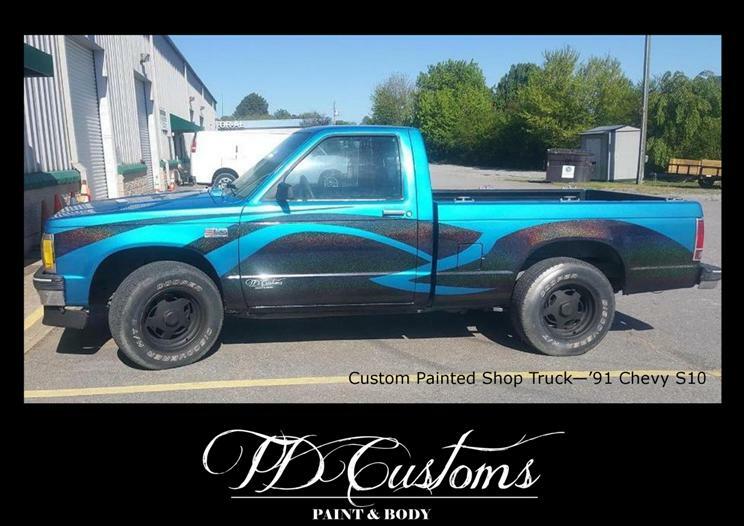 This shortbed, stepside truck also got a few other custom modifications, such as a new wood bed, new wheels, new glass, and many other new, custom accents. It was a very extensive restoration, but boy, was all that work and wait worth it for such a beautiful, custom created truck. And that’s a wrap on our best jobs of 2018. As we say goodbye to the year, we always like being able to make this calendar and see our work going forward. Each month, we’ll be reminded of a job well done and another beautiful vehicle that will be kept on the road for years to come. 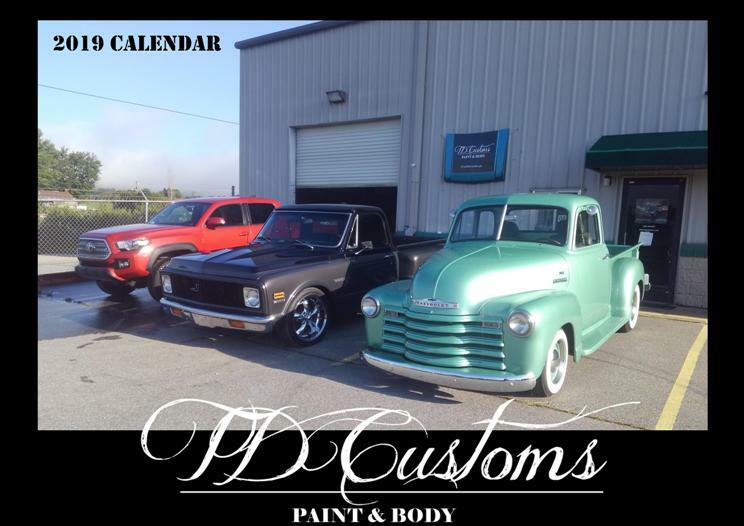 If your vehicle is featured in the calendar, we likely have or will be reaching out to send you one! If you’d like to purchase a calendar, they are $10. Let us know you’d like one, and we’ll be happy to hook you up! Thanks for sharing in our year and keeping up with us! From us at TD Customs, we wish you all a happy, healthy and safe 2019! No Replies to "TD Customs' 2019 Calendar!"